Last year in March Chinese leaders detailed the country's 13th five-year plan running from 2016 – 2020 which doubles-down on a long-stated commitment to "double 2010 GDP by 2020”. The 2020 GDP goal would require annual growth rates of 6.5% to go from a nominal $10 trillion last year to over $12 trillion in 2020. That's the equivalent of adding an economy the size of Switzerland's every year. China's official GDP data showed growth of 6.8% year-on-year in the fourth quarter, boosted by a raft of stimulus measures introduced by Beijing that has seen a number of metrics improve dramatically since the start of the year. Manufacturing activity hit a three-year high in December and fixed asset investment and industrial output all improved while real estate statistics indicated stronger investment. Imports of commodities including iron ore and copper hit annual records in 2016 and bank lending is growing at a solid clip despite restrictions designed to cool China's credit markets. 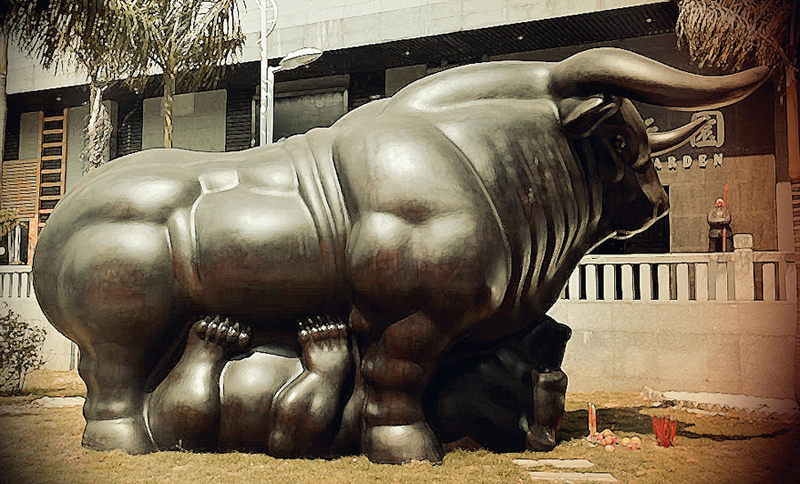 Skepticism about official Chinese growth figures abound. 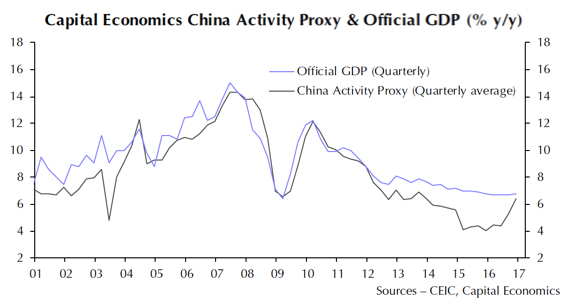 Growth has been at or near Beijing's official GDP growth targets for many quarters and many analysts peg actual GDP expansion at a lower clip. Independent research house Capital Economics' measure of the Chinese economy – the China Activity Proxy or CAP – uses a combination of weighted data including electricity usage, seaport cargoes, floor space under construction and passenger and freight traffic to gauge activity across a wide section of the economy. According to Capital Economics research, China's year-on-year GDP growth rate dropped below 4% in December last year (as metals, iron ore and coal prices hit multi-year lows) and stayed below 5% during the first half of 2016. But since then growth has picked up markedly hitting 6.8% in November. That's the fastest pace since 2013 using the Capital Economics gauge and the first time since 2011 that the two measures have converged. Stepping back, at 6.8% the economy is now expanding faster than is sustainable (we put trend growth at around 4½~5%). With policy support now being withdrawn, growth is set to peak soon.